To use a cliché, we live in a volatile uncertain complex and ambiguous (VUCA) world. Organizations simply cannot afford to try out new strategies in reality and correct mistakes, once they’ve occurred. The stakes are too high. Thus emerges the utility of this technique across functions like financial planning and risk management. Financial models help a business manager simulate the future and see the impact of their change, without risking costly setbacks of real world trials and errors. 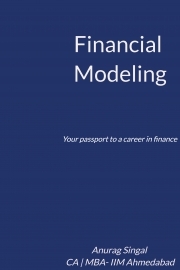 The book will help you deep dive into the vocabulary and the syntax, the art and science of financial modeling and valuation. You will be able to prepare/use existing models more competently, interpret the results and have greater comfort over the integrity and accuracy of he model’s calculations. It is suited for an aspirant who seeks to learn the art of preparing financial models in a logical structured and disciplined manner for M&A, VC/PE or Corp Fin teams of conglomerates. Anurag Singal is a Chartered Accountant with All India Rank 22 and 25 in CA Final and CA PE-II, respectively. He completed his PGPX (1 year MBA) from Indian Institute of Management, Ahmedabad. He received the “CA Young Achiever-Manufacturing Sector” at the 6th ICAI Awards 2013. He has a decade of Corporate Finance stint across leading conglomerates in India.